Do you remember life before the 2008 financial crisis? It’s strange to reflect on how different our world is today, from just ten years ago... in 2008. Maybe you took a Staycation, learned to knit, or started up-cycling? Over the next few years, workshops focused on skills forgotten began to emerge - food production, textiles and other artisan skills began to grow. While Etsy launched in 2005, the financial crisis is often credited for the resurgence of the craft industry. Today… did you know foraging is trendy? I had no awareness that this was a ‘thing’ until my brother started foraging for mushrooms a few years ago, but after a quick search on the internet, it appears that foraging’s come back dates back to 2014. 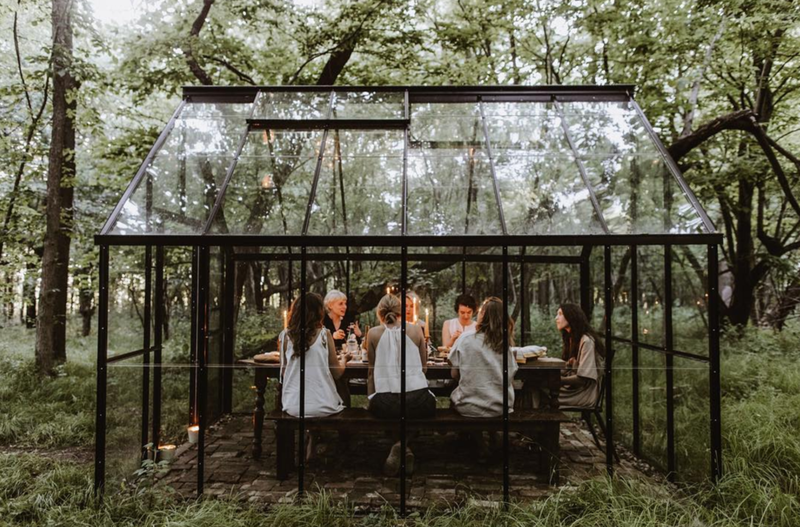 I started following Johnna Holmgren a few years ago after a friend shared a photo of a wooded greenhouse. Johnna is the woman behind the blog/IG - where she shares curated moments of a passionate hobby, turned lifestyle. I’m not sure if she accidentally built a brand online, a community, along the way… but I know she’s a self-described wife, mother, and woman striving to retain curiosity. Family and simplicity, in this busy world, seem to be of importance. In March of 2018, Fox Meets Bear was celebrating the Cucina Blog Awards, in Italy. In the months that follow, they publish a book, and the publisher recalls the book, the family sells their home and now seem to be hibernating. I, like many, are patiently waiting to celebrate (and support) them in life’s next chapter. We miss them! We forget that there is magic in food. We’ve lost an appreciation for how the ingredients we use came to be, how they grew, and where they were cultivated. In short, we’ve lost an appreciation for the earth. But Johnna Holmgren is here to restore that appreciation and help us create an adventurous spirit both in and out of the kitchen. She’s someone who goes straight to the woods behind her home for mushrooms and syrup and heads to her garden for tomatoes and fruits. Her cookbook is more than just a book—it’s an escape to another realm, a retreat into nature, and a taste of the life she lives. Forager’s Maple Yogurt: this recipe is just as sounds. The author offers a method to make yogurt, but you can buy plain yogurt, adding vanilla and maple syrup. I have fond memories of tapping the maple trees in our yard to collect maple syrup. You can read about maple syrup season on page thirty. Baked Cinderella Pumpkin Soup: Since getting the Ninja blender, Bill has been asking me to make him pumpkin soup. Today we are making this recipe! He avoids onion, and this recipe calls for bacon and jalapeno to give it the depth lost from removing onions. Snow Honey Loaf: I had to include this one. I grew up eating fresh snow - lots of it. This recipe calls for fresh snow, boiled, as an ingredient — a simple nod to winter life. Of course, tap water works fine, plus yeast and other ingredients to make this delicious bread. Foraging concerns: First let me acknowledge the serious safety concerns that pulled this book. I am not a forager and read this book knowing I would purchase the ingredients. I have dried flower petals, dried mushrooms, and elderberry extract in my pantry. While reading this book, I was in awe of this families lifestyle choices. On paper, they make it look effortless. I enjoyed this book, and plan to use it while creating the menu for an upcoming dinner party. Are you, like me, waiting to see this family emerge from a tough year?